Frederick J. Bowles was born October 8, 1845 in Norfolk England. The son of Rev. George Bowles and Alice Addock, the tenth of 13 children, he was the last child born in England. In 1846 when Frederick was just a year old, the family emigrated to the United States and settled in Ontario, New York. On February 29, 1864 at the age of 18, Frederick enlisted in the Union Army at Rose, New York. His enlistment papers give a physical description of five feet seven inches, gray eyes, black hair, and dark complexion. They list his occupation as a farmer. On March 1st he was "mustered in" when he placed his "X" on the line with a notation "his mark." He joined the 111th New York, Company K on April 11th in Dumpling, West Virginia. Frederick received $60.00 at the time of enlistment, a clothing allowance of $21.87, and his monthly salary of $15.68 for the months of March and April 1864. On May 5, 1864 Frederick received a wound at the Battle of the Wilderness. He eventually ended up at Mt. Pleasant Hospital in Washington, D.C. on June 7th. Given a hospital number of 11846, he was admitted to Ward 2. The admitting diagnosis was "chronic diarrhea." His medical records show he received the following treatment: "Diarrhea checked by opiates and astringent injections. Pneumonia treated by sedatives while system was supported by ammonia and other strong stimulants with supporting diet of milk punch ad libidum. Gradually sank whole of the afternoon and evening of the 17th and died on June 17, 1864 at 11:00 p.m."
His personal effects were meager and they tell you little about the individual: 1 blouse, 1 vest, 1 cap, 1 pair socks, 2 photographs, 8 postage stamps, 1 comb, 1 ink stand, 1 miniature case, 1 wallet and $10.00. These were sent to his father in Rose Valley, New York on July 9th. On the June 20th at 8:30 in the morning he was buried at Arlington Cemetery. His final resting place is grave 6397, section 13, grid number K-31. For service and death to his adopted country he received $97.55. Casualties for his regiment for the Battle of The Wilderness were 42 killed and 119 wounded. It is unknown if his wound contributed to his death, but since it occurred so shortly after the battle one might assume it was a factor. Some of his military records show his date of death as May 17, 1864, while others list June 17th. 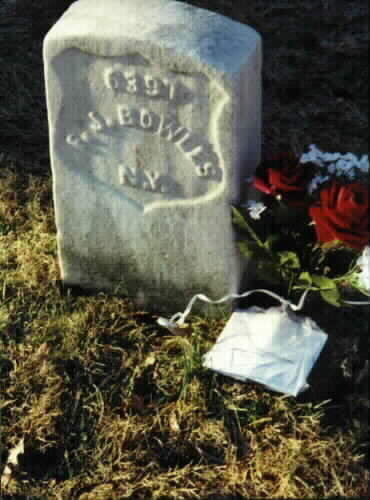 His grave at Arlington lists him as Fred I. Bowles. Frederick’s service to his country was not very long unlike his brothers Johnadab and James who survived the war and came home to marry and have families. In three short months he went from being a farm boy to dying alone in a strange city with no family or loved ones to be with him during those last moments. His family did not get to bring him home to New York and bury him with a sister who had died shortly after they arrived from England. In the end Frederick’s life was to be one of numbers. He was a battle casualty "number," a hospital "number," a grave "number," a section "number" and a grid "number." Well I have finally put the information regarding Frederick into some type of format. 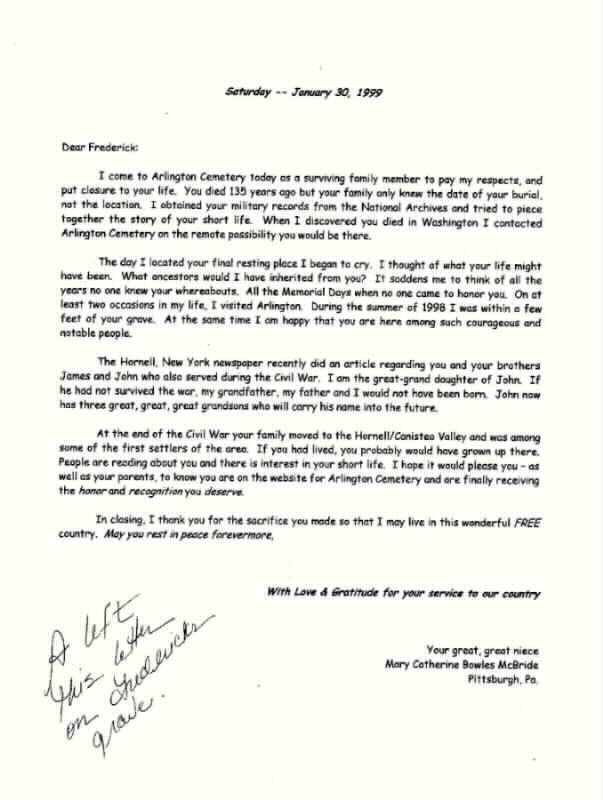 As I mentioned to you we are planning to visit his grave in Arlington in March 1999 and if possible I would like to include a picture with his biography. Before my father died he had told me about Frederick, my great-grandfather John and and their brother James who all fought in the Civil War. Frederick's whereabouts were never known. I feel such satisfaction at having finally found him and I will be the first person to ever visit his grave. When this is all complete I intend to surprise my family with this information. I hope somehow my father is aware of my efforts and is happy. Thank you so much for including him. ROSS: For the last 135 years, the Bowles family never knew what happened to Private Frederick J. Bowles, an 18-year-old soldier who perished in the Civil War. But Mary Bowles McBride, 49, of Ross, has found him. After a year-long search, she pinpointed her great-great uncle's whereabouts at Arlington National Cemetery. His final resting place - marked with a weathered tombstone - lies in the same row as the relatives of George Washington and Robert E. Lee. McBride and her husband, Robert, made a pilgrimage to Arlington two weeks ago. "The emotions were unbelievable," she said. Her first thought: "That's my last name." From English immigrant to New York farm boy to dead Civil War soldier, Frederick Bowles was a mystery. "Frederick saddened me," McBride said. "He was just a boy - my son is older than 18. Frederick died alone. He didn't have his mom with him. Nobody got to mourn at his grave." As a young girl, McBride brushed off her family's Civil War history. 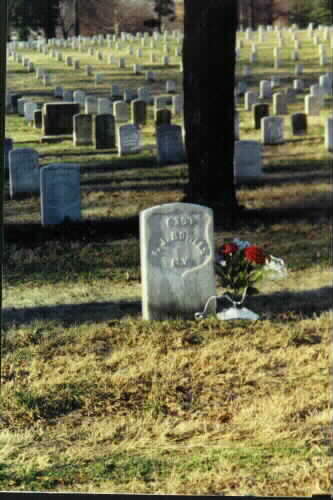 Her great-grandfather, John A. Bowles, and his two brothers, Frederick J. and James A., were in the infantry. Frederick was the only one who didn't return from the war. McBride's father tried to interest her in the family's history. But when she first visited Gettysburg, she was unimpressed, telling her father, "This is a farmer's field, Dad." McBride now admits that she just didn't get it. It wasn't until her husband, a Civil War buff, nudged her to explore some military history. While watching Ken Burns' public television series on the Civil War, McBride was stunned by the carnage and casualities. "I'm here because my great-grandfather got to come home," McBride said. That awakened her long-dormant interest, and she started searching her family's history in the war. Her first clue came from a park ranger at Gettysburg. He directed her to the National Archives, which has an amazing arsenal of military records, according to McBride. "It was like a puzzle I was always trying to put together," McBride said. She eventually contacted Arlington Cemetery, hoping her great-great uncle would be there. At first, McBride was disheartened - there was no Frederick Bowles at Arlington - but it turned out there was a Fred Bowles. And that was her ancestor. Now McBride wants to know more about what happened to Bowles in the hospital, so the search continues to find hospital records, if they exist. "It's an obsession," McBride's husband says of his wife's information-hunting. But the intrigue of the Civil War seems like an obsession for the couple. McBride says, "Other people go to the beach for vacations, we go to the battlefields."